· After a first or second job interview. Send a separate letter for each interview. Besides being proper business etiquette, and simply the polite, right thing to do, there are practical reasons why a tailored “thank you” letter can be a brief and smart investment of your limited time. A. It can indicate to the employer the manner in which you will conduct yourself if hired. It demonstrates a personalized touch and shows the interviewer(s) that you are a professional who is concerned about details. B. A customized letter represents a terrific and possibly last opportunity to leave a good impression and keep your name and conversation in the mind of the employer. Imagine interviewing many job candidates over a 10-day period in which you have a myriad of other meetings, deadlines, and responsibilities. Obviously, some interview details may become a bit fuzzy in the mind of an interviewer / hiring manager. He/she receives your well-written thank you letter, and as a result, you are more likely to positively stand out among competing job candidates. You’ve jogged his/her memory of the conversation with you and this may keep you at the top of the candidate list; or help put you there again. 1. Simply sending a thank you isn’t enough for you to stand out from the competition. You’ll need to tailor each letter to each person with whom you interview. This small but important extra step is something done by only half of professionals who do bother to send a thank you. This can be an edge for you. 2. Beware that people receiving your thank you letter sometimes forward it to someone else on the interview team, so again, please customize each letter. You don’t want your letters to be identical. a) during each interview, try to obtain a business card from the person with whom you are speaking. This gives you the correct spelling of his/her name, title, etc. b) have a pen and portfolio notepad with you during each interview so that you are prepared to jot down a specific point of interest here and there. Subsequently, when writing your thank you letter and you mention one or more of these specific points, you are showing that you were listening. Also, by referring to the specific point(s), you will help refresh the interviewer’s memory of you. c) to help you personalize each thank you letter,immediately after you have concluded the interview(s), i.e. while fresh in your own mind, I recommend that you jot down some additional points of interest discussed with each person, including anything that you believe in retrospect you could have stated or clarified with him/her that may have helped. Make a note of any information that was overlooked during the interview with each person, or that which was specifically requested by the interviewer. 4. Timeliness: Thank you letters should be sent within 24 hours of the interview. Do not put it off. To be effective, a thank you note should be sent before the hiring decision has been made, so it is best to e-mail and/or mail it as soon as possible after the interview. 5. 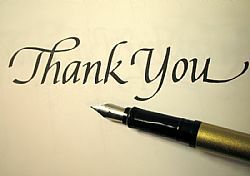 E-mail has generally become the preferred method by most interviewers to receive a thank you letter. It’s quicker (and keeps you in the employer’s memory) and can easily be shared (forwarded) to others. The e-mail subject line should read “Thank you for your time”. Also, you should still follow the standard letter format including name, address, title, etc. And if working with an external recruiter who set up the interview, always forward a copy of the thank you letter to him/her. b) if the e-mail is received, then the courtesy hardcopy is received 1-3 days later via regular mail, and is simply another opportunity to keep you in the mind’s eye of the employer. 7. Length, spelling, and grammar: The letter should only be a page or less in length. Anything longer and it may not be fully read, or if it is, the length may make it appear as if you are over-selling, i.e. desperate. And be sure to use good grammar and check for spelling errors. These errors can easily be avoided by running spell-check, etc., so having them in your letter suggests that you are less serious about the job, and generally pay less attention to details. 9. No matter how laid-back a company appears, keep your thank you letter professional. The employer wants to see that you know proper business etiquette. Still, it’s OK to express some individuality, maybe by choosing an artistic card, or including a photocopied article from a professional magazine which may reference a specific issue discussed in the interview. It says to the hiring manager that you were really focused on the conversation and serious about the opportunity. 10. A letter that’s not well thought out can only hurt you. For ideas on what to write, think back to the topics discussed during each interview. · General appreciation for the interview. Be sure to thank the interviewer for taking the time to meet with you. · Include reference to the position you interviewed for and the date of the interview. · Restate your continued interest and enthusiasm for the position and the employer. · Mention something you learned from the interview or comment on something of importance that you discussed. · Discuss what you can bring to the table. Parallel examples from your background to specific duties the job will include. Emphasize your strengths, experiences, skills, qualifications, accomplishments and slant them towards the points that the interviewer considered the most relevant for the position. · This is also the place to explain, restate, or clear up any potential and relevant misunderstandings. And you may mention any important information that was not discussed during the interview. · Once again, thank the interviewer for his/her time and consideration. · Indicate your eagerness for the next step. If appropriate, close with a suggestion for further action (if a second interview is a possibility), or mention that you will look forward to hearing further from your recruiter in a few days. · Provide your phone number and the hours you can best be reached.